Hitting the Hot-Spot: Hunk time! My new favorite TV show these days is The Mentalist. I don’t know if you’ve ever seen it. It’s cute and funny, if not really the most intellectually stimulating show around, lol. 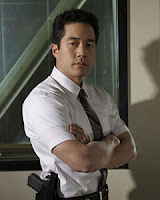 But with Simon Baker and Tim Kang in it, who cares! 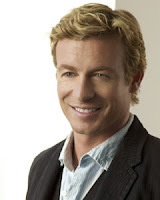 Australian actor Simon Baker plays Patrick Jain, a mentalist, working as a consultant for a homicide department in California. I’d never heard of a mentalist before but apparently it’s someone who can put together a psychological portrait and history of a person just by observing his or her behavior and appearance. He’s a lot like House and Sherlock Holmes in this way, but it’s always fun to watch. Truthfully, these two men perfectly fit my visuals for Timmy and Basho in “Yin Yang” and possibly John and Toshi in His Beautiful Samurai and in Beautiful Samurai, White Tiger. Yup. I can see your point!! Even if they don't kiss on the screen, you're the one in charge in your fantasies!